Google's Chromebook - The Future of Laptops? You are here: Home / Lifestyle / Google’s Chromebook – The Future of Laptops? I just bought a shiny new rose gold macbook 12. Yes you read that right. This article is about the Chromebook but let me begin by saying I just bought a new rose gold macbook 12. A few days later, one of my friends announced, he is buying a Chromebook. I was surprised. When you say Chromebook, I can only think of a low-powered netbook. My second reaction was – why do you need it? A Chromebook looks like a laptop on the outside but inside, it’s an entirely different thing. It runs on Linux based Google Chrome OS and uses the Google Chrome browser as its main interface. In simpler terms, it’s an ultra-portable, low priced laptop that runs ONLY the Google chrome web browser. It uses the Chrome browser as its gateway to getting everything done over the cloud. This may sound ridiculous a few years ago but with the technology of today, the web browser is a lot more powerful. See all of the different google web apps that you can use today from the chrome web store. There’s a lot of different applications already available apart from the standard Google apps. All of these will run in your Chrome web browser and designed to be primarily used while connected in the internet. Come to think of it, almost everything that we do typically with a laptop is using the web browser. But what makes the Chromebook stand out more is not just its price and portability but its simplicity. The Chromebook is reminiscent of the netbooks of before. The netbook boom started in 2007 when ASUS released the Eee PC, a 7 inch laptop. These netbooks were low-cost laptops that focused more on portability rather than performance. Typical screen sizes were from 5” to 12” and typical weight was an average of 2 to 2.5 lbs. These were designed to do low-power tasks such as web browsing and word processing. At the rise of social media and youtube back then, there was a market for netbooks. It only died when tablets were born. But the similarities of the old netbooks with Chromebook ends with low price and lightweight. The old netbooks were sluggish at best and they came with all the complexities of Windows. My aunt still owns a 2009 era netbook and I still have to worry about its anti-virus today among other things. The Chromebook typically runs only on a 2GB to 4GB of RAM and a 16GB or 32GB SSD storage. Compare this with a standard laptop that runs on 4GB to 8GB of RAM and a 250GB to 500GB SSD. The Chromebook is considered a low-end laptop by these standards. However, the performance is not hampered even with a lower powered processor compared to its big brothers because of its lightweight operating system and use of applications as a service. Applications as a service also known as software as a service (SaaS) lets applications run on the servers and use the server’s computing power rather than installing the applications on your device. With lesser power comes lower price and better battery. A good specced Chromebook can cost only $300 or less and its battery can last ~8 hours. I am excited to see how a Chromebook is defying the laptop standards we got used to. Whereas before, higher specifications albeit with higher cost were typically the king. The most successful implementation of technology are those that are seamlessly integrated in our day to day lives. Where we could focus more on doing and experiencing and less time and effort spent in making technology work. The campaign strategy of Apple throughout the years is through simplicity from product design to marketing. And they have started the message that we still know today – “It just works”. Apple focused on creating products not based on what people needed, but based on how human experience can be simplified while doing more and consuming more data at a faster rate. It’s interesting also to find out that Chromebooks outsold macs for the first time during Q1 of this year. Google’s innovation with Chromebook is right on track. 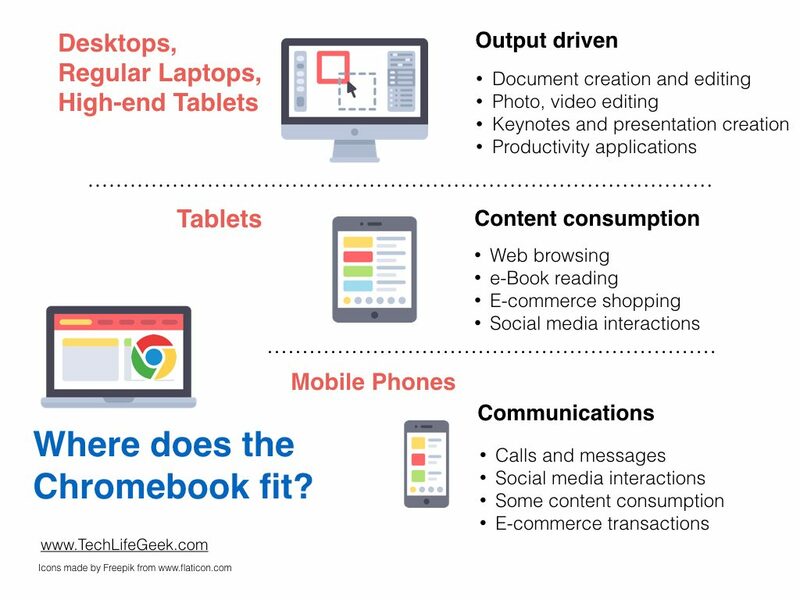 We don’t necessarily need a Chromebook but it is a differentiated product. Not until we try and use it do we discover a simpler way of accomplishing the same things. If you’ve used an Android phone or Apple’s iCloud services, you would have experienced the convenience of using the cloud. In the old times, when you buy a new phone or computer, it takes some effort to migrate all of your data from your old device to the new one. But with Google ID or Apple ID and cloud – you just log in to your new device and voila – all of your contacts, bookmarks, documents, photos, calendar, etc are all there. Some of us had a collection of installers, tools and best practices for setting up a new computer. But with Chromebook, we can forget about all of these. You just use it. The best technologies are intuitive. Without much effort and thought is needed such that it becomes the new normal. The Chromebook is anchored on cloud computing and software as a service. Both are currently shaping the future of personal computing. You login using your Google ID, use Google Drive, Google Docs, Gmail and YouTube all through Chrome browser. If you change your device, it doesn’t matter. You just need your Digital ID and login and all of your documents and apps will be there. No need to worry about updating the laptop or installing anti-virus. The Chromebook is more like your mobile phone. Auto-updates will be installed and no need to worry about any maintenance. You just use it! The internet of things is simply connected devices. The internet of things refers to the ability of things such as TV, Audio equipment, refrigerator, cameras, printers, sensors, laptop, etc. to exchange information with each other and with people through the internet. Here is a simple explanation of the Internet of things (IoT) from Forbes. We can do more things remotely with IOT becoming common today. Some examples are setting the home temperature, turning on/off of home lights, seeing who is on the front door, sending a video to the TV – all in from a mobile device. Google has been enabling us with IoT-like capabilities with the Chromecast, and Chromecast audio. These devices enable us to connect and interact with existing devices we already have at home like the TV and home speakers. You can send videos to your TV from your phone, or stream music to your speakers through WIFI. As an example, click here to know how you can use Chromecast for karaoke. The Chromebook is like a portal or a client that enables you to interact with these devices and apps through the internet at the convenience of a laptop looking device. Google continues to innovate and has committed to bring the Google Play store and Android apps available on many (but not all) Chromebooks starting fall of 2016. View the list of compatible Chromebook models before you buy a Chromebook. A good option to buy is the ASUS Chromebook Flip, for those looking for touch screen enabled Chromebooks. See more options from Amazon.com here and our recommended options here. Adding Android apps make the Chromebook more compelling to buy, bringing more features available on a low-powered machine. The Chromebook has simplified the user experience by combining the use of the cloud, software as a service and internet of things. It has removed the complexities away from the user and the mobile device by putting all of these in the cloud. This results to a lesser demand for high-end hardware and a simplified user interface. Others may argue that this gives lesser control to the user and this is true. If you have been used to Windows, moving to Chromebook might make you feel constrained. The Chromebook target market are people looking for a simple interface that get things done. They are less concerned on customisation options. All of the things we have said a Chromebook can do can be done by your existing devices – laptops, mobile devices and tablets through one way or another. So why should you consider buying a Chromebook and where does it fit in our typical use case of personal devices? Most of us probably already have all of these devices – a mobile phone, a tablet and a laptop or desktop. Do you really need to buy another device to add to your collection? My friend already has a high-end smartphone (several in fact), a Microsoft Surface Pro and a work laptop. He told me he was buying a Chromebook. I was confused by his statement. He does not really need it. His main complaint was he hates typing on the tablet and mobile device for long periods of time while watching TV. His surface pro keyboard was too flimsy to use on the lap while sitting on the sofa. The phone is too small while the work laptop is too bulky. While you can argue that his reasons are not compelling enough for an additional expense, let’s first try to put ourselves in his shoes. The average consumer would typically use multiple devices at the same time to interact with and consume data. We are forced to multi-task to keep up with the overwhelming information available. Typical scenario is sitting on the sofa watching TV while surfing the internet, talking with friends and doing online shopping all at the same time! We go back to simplicity and the internet of things as fundamental aspects for a having better experience of interacting with all of the data surrounding us. You’re watching CNN, typing a document in Google Docs. Then a friend sends you a message in Facebook messenger and another friend in Viber and you chat. Then you go back to your document. After a while you take a break and go to the amazon.com page you were viewing for shopping. A friend sends you a link to a YouTube video, you cast it to your TV via Chromecast and watch it and send your reactions to your friend via chat. This is a typical scenario today. Doing all of these on a mobile phone is not a good experience. Using a tablet to type 1000 words on your lap is not comfortable. 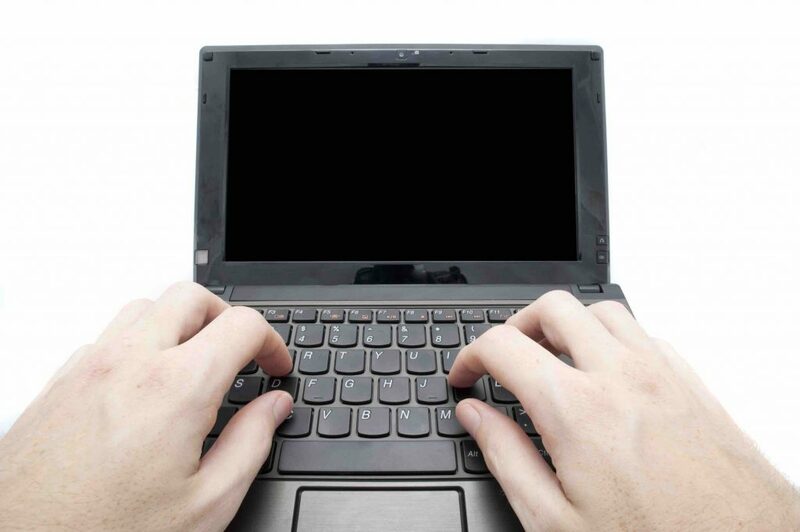 A laptop is definitely useful, more comfortable and efficient to use specially if it is lightweight. But you don’t need a $500 to $1200 laptop to bring you this convenience. The low price and simplicity of the Chromebook is the winning combination. Am I going to exchange my macbook 12 for a Chromebook? No. It was too late. But it made me stop to re-think my buying decision. In the future, I will consider it. But for now, I am replacing my aunt’s almost 10 year old netbook with Chromebook. Do you agree that the Chromebook is the future of laptops? Please share your thoughts by posting your comments below. Check out the related products from Amazon.com using the links below. I may get a small commission from the use of these links and your purchase helps the continuity of this site. Prices are the same if you purchase through these links or directly from Amazon. Thanks for your support. I think Chromebooks are a great investment for people who find themselves doing most of their computing online or through cloud based operation. For the most part, I barely use any third party programs while computing at home. I’m mostly using the Internet, Facebook, checking email and watching Youtube videos. I’ve realized that I never was using my expensive laptop to its full advantage. So, I sold it and made the switch to Chromebook. So far, I’ve never regretted the swap. Hi Henry, I couldn’t agree more. Most of the computing done today is exactly what you said – social media use, browsing the internet, email and watching videos. 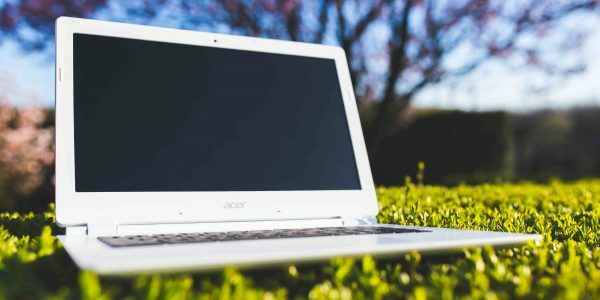 Not only does the Chromebook provides us a great cost effective choice and does what we need but it’s simplicity is very appealing – we just use it and never have to think about it. To give an update – I ended up buying an Asus Chromebook C202SA that is waterproof and shockproof. Great for older people and young people alike. This is the Chromebook I got for my aunt and it doubles as a learning computer for my young nephew.